Do you like to have a Sample ? Please contact me (maybe you have to make a friendship request). Please take a look to my open bottles. Ester. Calvados. Cider. Some refreshingly fruity acidity. Passion fruit. Lovely sweet and aftertaste. Body: Super-concentrated with great intensity, impressive and accessible. The lush fruity texture has managed to endure the significant oak aging impressively. Nose: The bouquet is fantastically floral - bluebell, primrose, violets, honeysuckle followed by glorious fruits, honey, melon, apricots and soft ripe peach. 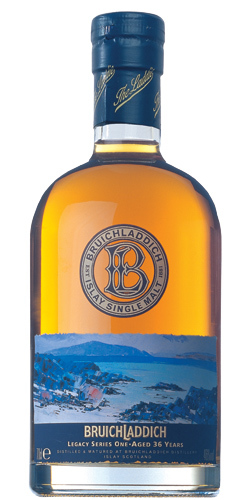 The flavours soar from the glass like clouds scudding across Loch Indaal. An outstanding olfactory experience. Palate: The first flavour is of the mature oak, which gives a crisp dryness to the spirit. This is followed by the sweet mellow bourbon notes. Then given a little time, the ripe soft fruits emerge to offer a nicely balanced mouth-feel. It´s a delicious combination of sweet fruit and subtle wood, with sea air adding distinctive honeyed grapefruit freshness. Finish: Remarkable length, the flavour lingers on endlessly, one minute for every year. An absolute beauty. Sometimes at whisky festivals a dream dram gets you a 1cl dribble in your misty, fingerprint laden glass. Other times you get a little lucky and find 4cl of quality malt poured neatly into a sample bottle to take home and pontificate over. In light of this good fortune, lets begin. T: Unexpected sour arrival, quickly becoming a dry, fruity [fab bar] malt,…. and then drier, yet more salivating as it opens up before then condensing. Salty now with ginger, cinnamon and other aromatic spices [cardamon, nigella, amchoor powder] and much [bourbon cask] candy overtones. It culminates in a swirling/complex maltiness that’s hard to pin down. F: Did i say opens up? It now feels like it shrunk,… and yet it becomes like treacle with grand oak notes, vintage cognac/Grand Marnier and some Irish cream. Condenses further, reduced to a salt malt. C: That’s complex and brilliant, I’ve never had a whisky like it. Its not what id call ‘satisfying’ yet it is totally intriguing however. This is exceptional fresh and alive for such an old whisky. It lacks a little bit of power, but what the hell … This is the kind of whisky bottles that cheers me up and restores my believe there’s still a lot of good in this world.